At the 2018 Spring Meeting in Warwick, the PhD and PostDoc representatives organises a series of events for young researchers. These ranged from asking questions such as “What is the secret to success?” through to some crafty synthetic biology and ending with the award of the 2018 BSDB writing competition. The career workshop kicked off the BSDB 70th birthday celebrations, with a topic focused on ‘building resilience and overcoming obstacles’. 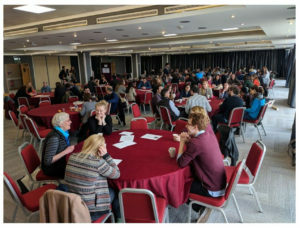 The idea was to utilise the knowledge and experience of the successful developmental biologists attending the meeting to give plenary and session talks. 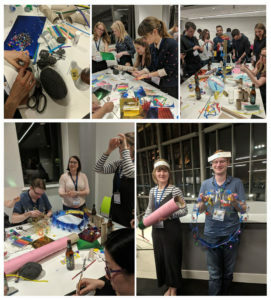 In total we had 18 tables, lead by Ottoline Leyser, Jordan Raff, Robb Krumlauf, Maria Leptin, Steve Wilson, Matthew Freeman, Fiona Watt, Magdalena Zernicka-Goetz, Jan Traas, Judith Kimble, Henrik Semb, Anne Ferguson-Smith, Patrick Lamaire, Jean Paul Vincent, Kate Storey, Austin Smith and Yohanns Belliache. We wanted to have honest and open discussions about how to succeed in academia. ‘What is the secret to success, if there is any?!’. It is not very often you get to have opportunity to pick the brains of the leaders in your area of interests. This led to an afternoon of lively discussions. The format of the last couple of student/postdoc socials have been designed to get people to interact with people other than their lab mates! This year was no exception. 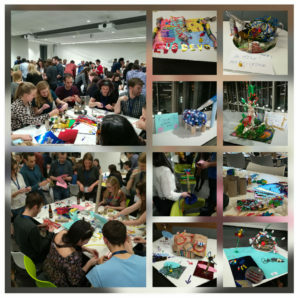 This year’s activity was for randomly assigned teams to build models, within 1 hour, of any one of the following themes: fertilisation, plant development, somitogenesis, cell-fate determination and evo-devo. We will let the pictures do the talking, but we were blown away by how amazing the models were and how much effort people put into making them. Megan Davey and Rita Sousa-Nunes judged the competition but had a hard time choosing winners since the models were excellent. We are grateful to all the exhibitors who kindly donated prizes: Abcam, Class Learning, Proteintech, Philosophical Transactions B and Biographical Memoirs, The Company of Biologists, Stratech, 2BScientific and Indigo Scientific. a trip to the 77th Annual Society of Developmental Biology meeting (Portland, Oregon, USA). Katherine Brown, Aidan Maartens, Ottoline Leyser and Jonathan Slack judged the competition, selecting Daniyal Jafree as the winner. So this year, is the final year for us organising these events. It has been a blast. Thank you all for making it such a wonderful and memorable experience. 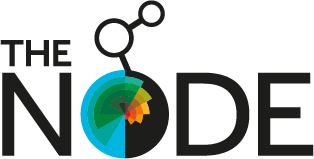 Please don’t forget to contact your future student (students@bsdb.org) or postdoc (postdocs@bsdb.org) reps for any comments or suggestions regarding the British developmental biology community. See here for more pictures of the student/postdoc events.